This survey of the cinema’s earliest landmarks and rarities features the 1877 motion studies of Edward Muybridge, the early productions of Thomas Edison’s Black Maria, the actualites of Louis Lumiére, George Méliès’s A Trip to the Moon (1902), and climaxes with the premiere of a mint-condition print of Edwin S. Porter’s The Great Train Robbery, complete with the authentic hand-tinting witnessed by audiences of 1903. The genesis of the motion picture medium is vividly recreated in this unprecedented collection of the cinema’s formative works. More than crucial historical artifacts, these films reveal the foundation from which the styles and stories of the contemporary cinema would later arise. An animated rendering of Eadweard Muybridge’s primitive motion studies (1877-85) begins the program, immediately defining the compound appeal of cinema as both a scientific marvel and sensational popular entertainment. This is followed by the works of Louis and Auguste Lumière, who offer cinematic glimpses of such commonplace sights as children quarreling, a lion in a zoo or the feeding of poultry. 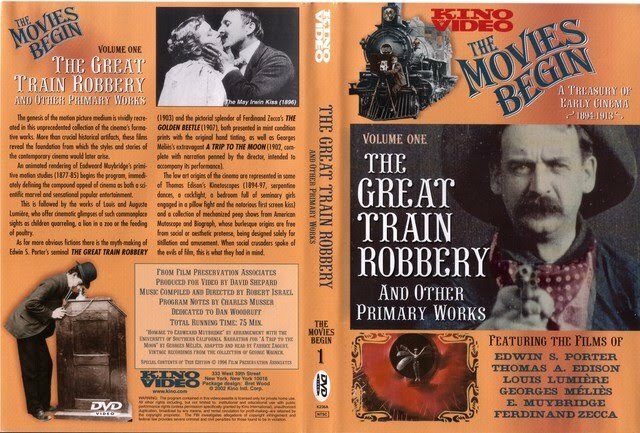 As for more obvious fictions there is the myth-making of Edwin S. Porter’s seminal The Great Train Robbery (1903) and the pictorial splendor of Ferdinand Zecca’s The Golden Beetle (1907), both presented in mint condition prints with the original hand-tinting, as well as Georges Méliês’s extravagant A Trip To The Moon (1902, complete with narration penned by the director, intended to accompany its performance). The low art origins of the cinema are represented in some of Thomas Edison’s Kinetoscopes (1894-97, serpentine dances, a cockfight, a bedroom full of seminary girls engaged in a pillow fight and the notorious first screen kiss) and a collection of mechanized peep shows from American Mutoscope and Biograph, whose burlesque origins are free from social or aesthetic pretense, being designed solely for titillation and amusement. When social crusaders spoke of the evils of film, this is what they had in mind.